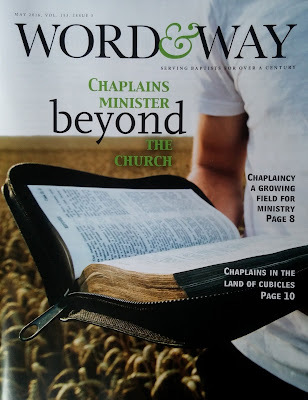 I wrote the cover package on chaplaincy ministries for the May issue of Word&Way (a Baptist magazine in the Midwest). The first article, Chaplaincy Viewed as Growing Field for Ministry, considers how chaplaincy ministries are changing and might look in the future. The piece includes comments from Gerry Hutchinson (endorser for chaplains and pastoral counselors for the Cooperative Baptist Fellowship) and Bobby Smith (director of chaplaincy relations for the Baptist General Convention of Texas). The second article, Chaplains in the Land of Cubicles, looks at one particular area of growth in the area of chaplaincy: workplace chaplains. The piece includes comments from Rich Shockey (Marketplace Chaplains division director for Iowa, Kansas, Missouri and Nebraska) and Kevin Bussey (a Corporate Chaplains of America chaplain). I hope the articles bring more attention to an important type of ministry and help some people consider ways to participate or support.